Angelica shikokiana (Apiaceae) is a Japanese traditional herb and widely marketed as a dietary food supplement as a health tea preparation consumed as a daily beverage for its health benefits. Our previous research showed that the methanol extract of the aerial parts of A. shikokiana and its major coumarin, isoepoxypteryxin had a significant cytotoxicity against HepG2 cell line. In this study, we investigated the hepatoprotective activity more deeply by the in vitro inhibition of HepG2 cells invasion assay and in vivo using thioacetamide-induced hepatocellular carcinoma model in rats. The ex vivo levels of nitric oxide production, inducible nitric oxide synthase, vascular endothelial cell growth factor-C and caspase-3 were also estimated to investigate the possible mechanisms of hepatoprotection. The methanol extract of A. shikokiana and isoepoxypteryxin concentration-dependently depressed the invasion of HepG2 cells induced by 12-O-tetradecanoylphorbol 13-acetate. In vivo, they significantly reduced the levels of alanine transaminase, aspartate transaminase, gamma-glutamyl transpeptidase, total bilirubin and nitric oxide production when compared with hepatocellular carcinoma group. Besides, the thioacetamide-injected groups treated with methanol extract of A. shikokiana and isoepoxypteryxin exhibited a significant increase in the level of caspase-3 protein and a significant decrease of inducible nitric oxide synthase and vascular endothelial cell growth factor C levels when compared with hepatocellular carcinoma group. To the best of our knowledge, this is the first report of the hepatoprotective effect of A. shikokiana and isoepoxypteryxin against hepatocellular carcinoma. Hepatocellular carcinoma (HCC) is the fifth most prevalent type of cancer and the third leading cause of cancer-related death , that caused 6 00 000 cases of death per year especially in the developing countries . Around one million new cases of HCC are estimated to arise every year . Conventional treatments including chemotherapeutic synthetic drugs or interferons cause serious side effects . Consequently, searching for new treatments and protections especially from medicinal plants provides an unlimited source for alternative strategies to alleviate and limit the HCC severity and expansion. Angelica shikokiana Makino is a Japanese traditional herb known as Inutoki (Nihonyamaninjin), and it is widely marketed as a dietary food supplement for treating digestive and circulatory systems diseases. Our previous study  confirmed that the alcoholic extract of the leaves and stems had strong antioxidant and antiinflammatory activities. Further, previous studies incorporated the methanol extract of A. shikokiana among food and drink additives preparations used for tumor inhibition. Additionally, our recent research  showed that the methanol extract of A. shikokiana (EXT) and its major coumarin; isoepoxypteryxin had a potent cytotoxicity against HCC cell line (HepG2). A previous study described the hepatoprotective activity and the inhibitory activity of isoepoxypteryxin; isolated from another species A. furcijuga Kitagawa; on nitric oxide (NO) production in macrophages of immunologically-induced liver injury by D-galactosamine (D-G) and lipopolysaccharide (LPS) in primary cultured rat hepatocytes . However, to the best of our knowledge, there is no previous report about either the hepatoprotective activity of A. shikokiana or isoepoxypteryxin against HCC or their possible mechanisms of the activity. So, this study was designed to measure the in vitro and the in vivo protective activities of EXT and isoepoxypteryxin and to estimate their effect on activation of apoptosis by measuring the caspase-3 level. Moreover, the effect of EXT and isoepoxypteryxin on hepatic NO production, inducible nitric oxide synthase (iNOS) and vascular endothelial growth factor-C (VEGF-C) were assessed. The fresh aerial parts of A. shikokiana (voucher specimen no. Y-1) were dried using freezedryer (DSJ-mini, PLUS Y'S CO., LTD, Japan) for 72 h. Twenty-four hours later, one kg of the dried powder was extracted with methanol (1.5 l×3) at room temperature 25° to prepare EXT. The extract was concentrated on a rotary evaporator and the percent yield was 8.4%. Isoepoxypteryxin was isolated and characterized as previously described . The assay was performed as described, previously . Briefly, HepG2 cell suspension (2.5×104 cells/ml) containing 0.5% FBS-DMEM medium and different concentrations of EXT, isoepoxypteryxin or 5 μM of taxol (as a positive control)  was deposited into the upper part of the well insert (previously coated with diluted matrigel with a final concentration of 250 μg/ml under sterile conditions) of each chamber in a 24 well plate. The lower chambers were loaded with 10% FBS-DMEM medium containing 100 n MTPA (as a promoter of the cell invasion) . After 12 h incubation at 37°, 5% CO2 atmosphere the noninvasive cells were removed via gentle scraping. The invasive cells attached to the lower surface of the membrane were fixed in 4% paraformaldehyde at room temperature for 30 min and stained with crystal violet for 10 min. Three randomly selected views of the upper chamber were photographed using a Nikon Microscope (TE200). After extensive washing with PBS, the dye was extracted with 10% acetic acid and the absorbance at 595 nm was recorded using spectrophotometer (Shimadzu, Japan). The animal protocol was approved by the ethical committee in Faculty of Pharmacy, University of Mansoura (protocol code no. 2014-48). The research was conducted in accordance with internationally accepted principles for laboratory animal use and care of the European community guidelines. Seven weeks old male Sprague Dawley rats weighing 180-200 g were used. All animals in the study were maintained under standard conditions of temperature 25°, with regular 12 h light/12 h dark cycle and allowed free access to food and water. The animals were randomly divided into seven groups of 10 rats  each as described below: in group 1 (normal control) rats were p.o. injected 0.5% CMC solution (vehicle used for preparing the extract and isoepoxypteryxin) for 18 w, twice/week; group 2 (extract; EXT) rats were p.o. injected with 100 mg/kg EXT for 18 w, twice/week; group 3 (isoepoxypteryxin) rats were p.o. injected with 50 mg/kg isoepoxypteryxin for 18 w, twice/week; group 4 (HCC group) rats were p.o. injected with 0.5% CMC solution for 2 w then continued its injection along with 200 mg/kg TAA for 16 w, twice/week (a dose, which previously reported [13,14] to cause HCC in the same type of rats); group 5 (silymarin as positive control ) rats were p.o. injected with 50 mg/kg silymarin alone for 2 w, twice/week then continued its injection along with i.p. injection of TAA 200 mg/kg for 16 w, twice/ week; group 6 (EXT+HCC) rats were p.o. injected 100 mg/kg EXT alone for 2 w then continued its injection along with i.p. injection of TAA 200 mg/kg for 16 w, twice/week; group 7 (isoepoxypteryxin+HCC) rats were p.o. injected 50 mg/kg isoepoxypteryxin alone for 2 w then continued its injection along with i.p. injection of TAA 200 mg/kg for 16 w, twice/week. At the end of the study period, rats were sacrificed for collection of samples. Blood was obtained from retro-orbital venous plexus. The collected blood was centrifuged at 3000 g for 10 min to separate the serum. The separated serum was assayed on the same day of collection for biochemical markers of liver injury. Liver tissues were excised, rinsed and then homogenized (10% w/v) in ice-cold sodium-potassium phosphate buffer (0.01 M, pH 7.4) containing 1.15% KCl. The homogenates were centrifuged at 3000 g for 20 min at 4°. The supernatant was collected; the total protein content was measured by Bradford method (Bio-Rad, Richmond, CA) according to manufacturer's instructions. Thereafter, supernatants were kept in –80° till used for biochemical determination. Another liver portion was fixed in 10% buffered formaldehyde for histopathological analysis. Biochemical markers of liver injury, including serum alanine aminotransferase (ALT) and aspartate aminotransferase (AST), γ-glutamyltranspeptidase activities (GGT), albumin and total bilirubin levels were determined using commercial kits (Elitech, France), (Vitro Scient, Germany), (human, Germany) and (Biodiagnostics, Egypt), respectively according to manufacturers' instructions. Hepatic NO levels were determined using a kit from (Biodiagnostics, Egypt) according to manufacturer's protocol. Briefly, the principle of the assay based on a diazotization reaction. First, NO was converted to nitrous acid in acidic medium. The formed nitrous acid diazotized sulphanilamide and the produced diazonium ion then coupled with N-(1–naphthyl) ethylene diamine to produce a chromophoric azo dye that was measured at 540 nm . A commercially available kit (Cloud- Clone Corp., Houston, USA) was used to determine caspase-3 levels in liver homogenates by ELISA method following the manufacturer’s procedure. The liver was cut and ﬁxed in 10% buffered formalin and embedded in parafﬁn. Four-micrometre thickness sections were cut and stained with haematoxylin and eosin for examination of cell structure by light microscope. Hepatic specimens were anonymously coded and examined in a masked manner. The morphologic changes were photographed using a digital camera-aided computer system (Nikon Digital Camera, Japan). Levels of iNOS (MyBioSource, Inc., CA, USA) and VEGF-C (Diaclone SAS, Cedex, France) were determined in liver tissue homogenates using ELISA kits and according to the manufacturers’ protocol. Statistical analysis and figures of the experimental data were performed using Prism software (GraphPad Prism 5, San Diego, CA). Results were expressed as means±SEM of 10 animals/group, and differences between groups were tested for significance using analysis of variance (ANOVA), followed by Tukey’s post hoc test. Statistical significance was predefined as P≤0.05. Inhibitory activity of EXT and isoepoxypteryxin against HepG2 cells invasion induced by TPA, which is a well-known tumor promoter and a potential inducer of invasion in cancer cells, was investigated. 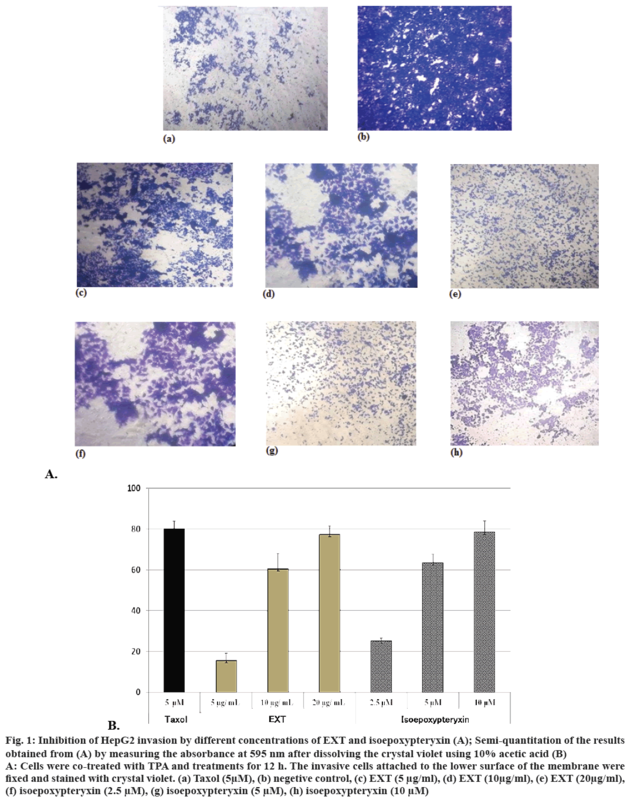 The results (Figure 1A and B) showed that the amounts of cells degraded the matrigel and invaded into the lower surface of the membrane were significantly reduced (by comparing to the negative control) after 12 h treatment with EXT and isoepoxypteryxin in a dose-dependent manner. There was no significant difference between the inhibitory activity of EXT and isoepoxypteryxin. In this study, TAA-induced HCC model in rats was used to evaluate the hepatoprotective effects of EXT and its major coumarin; isoepoxypteryxin. Biochemical parameters ALT, AST, GGT and total bilirubin and serum albumin were significantly (P<0.001) elevated and decreased, respectively in HCC group (200 mg/kg TAA, i.p.) when compared with the normal control group (Figure 2). Pretreatment with EXT and isoepoxypteryxin inhibited both TAA-induced elevation of ALT, AST, GGT, total bilirubin and decrease in serum albumin significantly when compared with HCC group. Isoepoxypteryxin showed stronger activity in lowering the levels of ALT and total bilirubin than silymarin (positive control) or EXT. The treatment with either EXT or isoepoxypteryxin alone didn’t show any significant change in the biochemical parameters from the normal group. 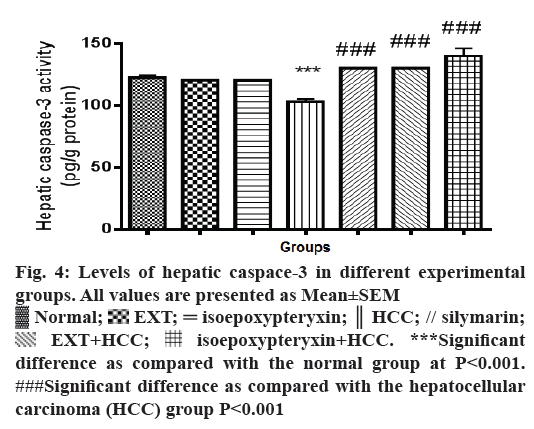 Hepatic homogenates from rats in HCC group showed a significant reduction (P<0.001) of caspaase-3 levels compared with normal group (Figure 4). On the other hand, hepatic tissues of the rats received a 100 mg/kg dose of EXT showed significant (P<0.001) increase in caspase-3 levels nearly same to that of normal and silymarin groups while a dose of 50 mg/kg of isoepoxypteryxin demonstrated higher induction of caspase-3 more than that of silymarin-treated groups. Those results were further confirmed by the histological examinations (Figure 3G, H and Table 1), which showed higher apoptotic index number of apoptotic bodies in 10 high power field X400, 12 and 14 in the case of HCC groups treated with silymarin and isoepoxypteryxin, respectively. The effect of EXT and isoepoxypteryxin on the production of hepatic NO and the levels of iNOS was investigated as a possible mechanism of their hepatoprotection. The levels of NO production, as well as iNOS, was significantly (P<0.001) elevated in the hepatic tissues of the rats in HCC group when it was compared to the normal group (Figure 5A and B). Pre- and co-treatment with EXT or isoepoxypteryxin resulted in significant reduction of NO and iNOS levels nearly to the same levels of silymarin treatment. Rat groups received EXT or isoepoxypteryxin without induction of HCC did not show any significant difference from the normal group indicating that their special activities on NO or iNOS in HCC groups. Rats in HCC groups showed a significant induction of VEGF-C levels (P<0.001) while pre and co-treatment with EXT or isoepoxypteryxin resulted in significant reduction towards the restoration of the normal group levels (Figure 6). Rats treated with EXT or isoepoxypteryxin without HCC induction showed similar levels of VEGF-C of the normal group. This difference in the activities confirms that the ability of EXT and isoepoxypteryxin to inhibit VEGF-C could be considered as one of their hepatoprotective mechanisms. Natural products are involved in the treatment of various diseases including cancer. Indeed, many cancer medications are molecules isolated from natural products or their synthetic analogs . Despite the several researches in the field of cancer therapies, still, there is a great demand to develop new drugs with improved efficacy, affordable cost and no side effects. In the current study, the anticancer activity of EXT and its major coumarin; isoepoxypteryxin against HCC and their molecular mode of action were investigated. The poor prognosis of HCC is largely due to a high rate of metastasis. Metastasis is one of the leading causes of death among HCC patients . Metastasis and invasion of cancer are crucial complicated multistep events in HCC progression . Therefore, the reduction of the metastasis could be a promising stratagem for the treatment of HCC. In the present study, both EXT and isoepoxypteryxin showed antiinvasive effect on TPA-induced HepG2 cells migration and invasion. The comparable activity of EXT and isoepoxypteryxin verified that other active agents; than isoepoxypteryxin, in EXT might also contribute to its activity and this point needs further investigation. Several studies have outlined that repeated administration of TAA leads to fibrosis in mice over a period of 10-15 w [13,14]. The main carcinogenetic effect of TAA is related to its metabolite thioacetamides-oxide, which increases the oxidative stress formation in the liver and progressively leads to DNA damage and HCC development . The hepatotoxic effects of TAA range from acute liver toxicity and damage using i.p. single dose of 350 mg/kg  to HCC with a chronic i.p. dose of 200 mg/kg [21,22]. It is well established that from the 16th w of the TAA treatment, a whitish, visible HCC tumours are well observed . Accordingly, this study used TAA rat model of chronic liver injury to assess the potential hepatoprotective effect of EXT and isoepoxypteryxin. Interestingly, EXT and isoepoxypteryxin alleviated the imbalance in biochemical markers of liver integrity and function observed in TAA-induced hepatocellular injury and degenerative changes. Moreover, EXT and isoepoxypteryxin restored the normal hepatic structure, suggesting protective effects of EXT and isoepoxypteryxin against hepatic tissue damage and subsequent dysfunction in HCC. Caspase-3 is a downstream effector in the apoptotic pathway. Hepatic caspase-3 levels were determined to investigate the hepatoprotective activities of EXT and isoepoxypteryxin through induction of tumor cell apoptosis . HCC is associated with dysregulation of apoptosis. Such an event was previously confirmed in liver cancer cells . In the present study, EXT and isoepoxypteryxin showed significant increase in caspase-3 activity, suggesting beneficial effect of both EXT and isoepoxypteryxin on dysregulated apoptosis associated with HCC. Another explanation for the hepatoprotective effect of EXT and isoepoxypteryxin is linked to the suppression of NO production. NO is a signalling molecule and is always associated with the pathogenesis of several types of cancer. iNOS results in the high-output production of NO, and its overexpression has been outlined in various human neoplasms, such as colorectal, hepatocellular and pancreatic cancers. It promotes tumor angiogenesis by increasing the blood flow in the tumor neovasculature and so enhances tumor growth, invasion, and metastasis [25,26]. Interestingly, our results revealed that EXT and isoepoxypteryxin reduced TAA-induced increase in hepatic iNOS and NO levels. Our results of the inhibitory activity of NO production of isoepoxypteryxin matched well with previously reported data  of isoepoxypteryxin isolated from A. furcijuga Kitagawa. The study  confirmed that the acyl groups of isoepoxypteryxin were essential for potent activity. 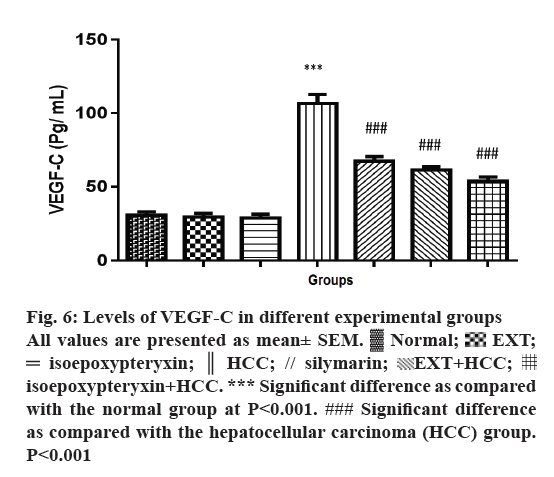 The effect of EXT and isoepoxypteryxin on hepatic VEGF-C was assessed. Activation of VEGF signalling triggers the proliferation and migration of endothelial cells. These events play crucial role in tumor development, invasion, and metastasis in HCC  . Several studies reported elevated VEGFs expression in aggressive cancers. Of note, VEGF-C is associated several metastatic human malignancies . VEGF-C is an important and a major mediator of physiologic and pathogenic angiogenesis of HCC . The knockdown of VEGF-C markedly inhibited invasion and migration of liver cancer cells . Accordingly, EXT and isoepoxypteryxin treatment significantly reduced hepatic VEGF-C levels in TAA-induced HCC rat model. In conclusion, our results demonstrated that the methanol extract of the aerial part of A. shikokiana and its major isolated coumarin, isoepoxypteryxin showed in vitro hepatoprotective activity by inhibition of HepG2 invasion and potent in vivo activity against TAA-induced HCC in rats. The in vivo hepatoprotective activity was correlated with several mechanisms including their ability to induce apoptosis by increasing the levels of caspaase-3. 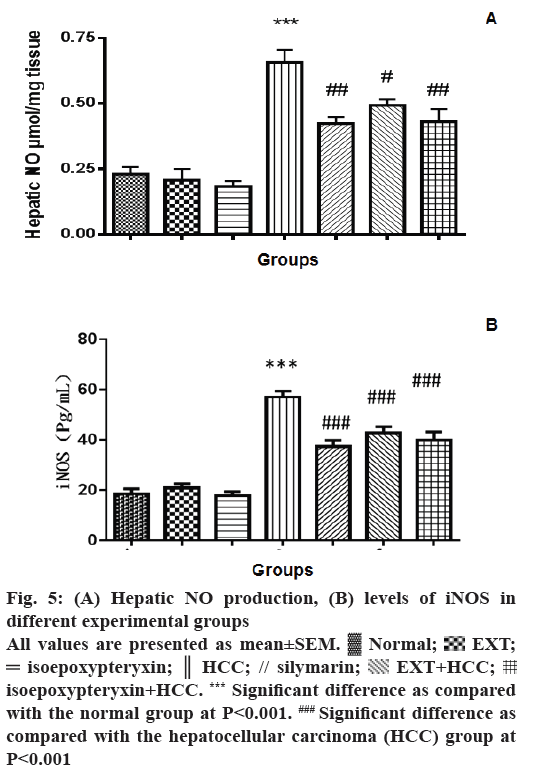 Further, EXT and isoepoxypteryxin reduced production of hepatic NO production by inhibition of iNOS. Additionally, they inhibited the increased levels of VEGF-C; associated with HCC. Future pharmacokinetic and comparative studies are mandatory to determine the other hepatoprotective active compounds of A. shikokiana. We would like to thank Joy Plus (Y. Tateyama), of Fukouka, Japan, for providing the plant powder. Romano PR, McCallus DE, Pachuk CJ. RNA interference-mediated prevention and therapy for hepatocellular carcinoma. Oncogene 2006;25:3857-65. Gomaa AI, Khan SA, Toledano MB, Waked I, Taylor-Robinson SD. Hepatocellular carcinoma: epidemiology, risk factors and pathogenesis. World J Gastroenterol 2008;14:4300-8. Spaniel C, Honda M, Selitsky SR, Yamane D, Shimakami T, Kaneko S, et al. MicroRNA-122 abundance in hepatocellular carcinoma and non-tumor liver tissue from Japanese patients with persistent HCV versus HBV infection. PLoS One 2013;8:e76867. Subramaniam A, Shanmugam MK, Ong TH, Li F, Perumal E, Chen L, et al. Emodin inhibits growth and induces apoptosis in an orthotopic hepatocellular carcinoma model by blocking activation of STAT3. Br J Pharmacol 2013;170:807-21. Mira A, Tanaka A, Tateyama Y, Kondo R, Shimizu K. Comparative biological study of roots, stems, leaves, and seeds of Angelica shikokiana Makino. J Ethnopharmacol 2013;148:980-7. Mira A, Shimizu K. In vitro cytotoxic activities and molecular mechanisms of Angelica shikokiana extract and its isolated compounds. Phrarmacognosy Mag 2015;11:564-9. Matsuda H, Murakami T, Kageura T, Ninomiya K, Toguchida I, Nishida N, et al. Hepatoprotective and nitric oxide production inhibitory activities of coumarin and polyacetylene constituents from the roots of Angelica furcijuga. Bioorg Med Chem Lett 1998;8:2191-6. Mira A, Yamashita S, Katakura Y, Shimizu K. In vitro Neuroprotective activities of compounds from Angelica shikokiana Makino. Molecules 2015;20:4813-32. Li T, Xu WS, Wu GS, Chen XP, Wang YT, Lu JJ. Platycodin D induces apoptosis, and inhibits adhesion, migration and invasion in HepG2 hepatocellular carcinoma cells. Asian Pac J Cancer Prev 2014;15:1745-49. Thaiparambil JT, Bender L, Ganesh T, Kline E, Patel P, Liu Y, et al. Withaferin A inhibits breast cancer invasion and metastasis at sub‐cytotoxic doses by inducing vimentin disassembly and serine 56 phosphorylation. Int J Cancer 2011;129:2744-55. Shimao Y, Nabeshima K, Inoue T, Kono M. TPA-enhanced motility and invasion in a highly metastatic variant (L-10) of human rectal adenocarcinoma cell line RCM-1: selective role of PKC-alpha and its inhibition by a combination of PDBu-induced PKC down regulation and antisense oligonucleotides treatment. Clin Exp Metastasis 1999;17:351-60. Tayel A, El Galil KH, Ebrahim MA, Ibrahim AS, El-Gayar AM, Al-Gayyar MM. Suramin inhibits hepatic tissue damage in hepatocellular carcinoma through deactivation of heparanase enzyme. Eur J Pharmacol 2014;728:151-60. Salguero PR, Roderfeld M, Hemmann S, Rath T, Atanasova S, Tschuschner A, et al. Activation of hepatic stellate cells is associated with cytokine expression in thioacetamide-induced hepatic fibrosis in mice. Lab Invest 2008;88:1192-203. Neal RA, Halpert J. Toxicology of thiono-sulfur compounds. Annu Rev Pharmacol Toxicol 1982;22:321-39. Girish C, Koner BC, Jayanthi S, Ramachandra RK, Rajesh B, Pradhan SC. Hepatoprotective activity of picroliv, curcumin and ellagic acid compared to silymarin on paracetamol-induced liver toxicity in mice. Fundam Clin Pharmacol 2009;23:735-45. Castéra L, Vergniol J, Foucher J, Le Bail B, Chanteloup E, Haaser M, et al. Prospective comparison of transient elastography, Fibrotest, APRI, and liver biopsy for the assessment of fibrosis in chronic hepatitis C. Gastroenterology 2005;128:343-50. Darweish M, Abbas A, Ebrahim A, Al Gayyar M. Chemopreventive and hepatoprotective effects of Epigallocatechin gallate against hepatocellular carcinoma: role of heparan sulfate proteoglycans pathway. J Pharm Pharmacol 2014;66:1032-45. Chen H, Miao R, Fan J, Han Z, Wu J, Qiu G, et al. Decreased expression of miR-126 correlates with metastatic recurrence of hepatocellular carcinoma. Clin Exp Metastasis 2013;30:651-8. Chung YH, Song IH, Song BC, Lee GC, Koh MS, Yoon HK, et al. Combined therapy consisting of intraarterial cisplatin infusion and systemic interferon‐α for hepatocellular carcinoma patients with major portal vein thrombosis or distant metastasis. Cancer 2000;88:1986-91. Koblihová E, Mrázová I, Vernerová Z, Ryska M. Acute liver failure induced by thioacetamide: selection of optimal dosage in Wistar and Lewis rats. Physiol Res 2014,63:491-503. Tayel A, Galil KE, Ebrahim M. Suramin inhibits hepatic tissue damage in hepatocellular carcinoma through deactivation of heparanase enzyme. Eur J Pharmacol 2014;728:151-60. Darweish MM, Abbas A, Ebrahim MA, Al-Gayyar MM. Chemopreventive and hepatoprotective effects of Epigallocatechin-gallate against hepatocellular carcinoma: role of heparan sulfate proteoglycans pathway. J Pharm Pharmacol 2014;66:1032-45. Dashti H, Jeppsson B, Hägerstrand I, Hultberg B, Srinivas U, Abdulla M, et al. Thioacetamide- and carbon tetrachloride-induced liver cirrhosis. Eur Surg Res 1989;21:83-91. Shieh DE, Chen YY, Yen MH, Chiang LC, Lin CC. Emodin-induced apoptosis through p53-dependent pathway in human hepatoma cells. Life Sci 2004;74:2279-90. Lala PK, Orucevic A. Role of nitric oxide in tumor progression: Lessons from experimental tumors. Cancer Metastasis Rev 1998;17:91-106. Oktem G, Karabulut B, Selvi N, Sezgin C, Sanli UA, Uslu R, et al. Differential effects of doxorubicin and docetaxel on nitric oxide production and inducible nitric oxide synthase expression in MCF-7 human breast cancer cells. Oncol Res 2004;14:381-6. Gao JZ, Wang YL, Li J, Wei LX. Effects of VEGF/VEGFR/K-ras signalling pathways on miRNA21 levels in hepatocellular carcinoma tissues in rats. Genet Mol Res 2015;14:671-9. Zhang H, Yin Y, Zhang L, Zheng X, Gao D, Chen K, et al. The effects of vascular endothelial growth factor C knockdown in esophageal squamous cell carcinoma. J Cancer Res Clin Oncol 2012;138:133-9. Yamaguchi R, Yano H, Nakashim O, Akiba J, Nishida N, Kurogi M, et al. Expression of vascular endothelial growth factor-C in human hepatocellular carcinoma. J Gastroenterol Hepatol 2006;21:152-60. Liu Z, Wang J, Mao Y, Zou B, Fan X. MicroRNA-101 suppresses migration and invasion via targeting vascular endothelial growth factor-C in hepatocellular carcinoma cells. Oncol Lett 2016;11:433-8.